Aikido (Japanese: 合気道 Hepburn: Aikidō?) [a.i.ki.doː] is a Japanese martial art developed by Morihei Ueshiba as a synthesis of his martial studies, philosophy, and religious beliefs. 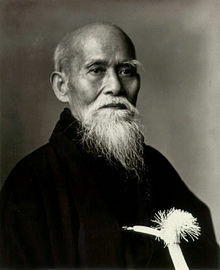 Aikido is often translated as “the Way of unifying (with) life energy” or as “the Way of harmonious spirit.” Ueshiba’s goal was to create an art that practitioners could use to defend themselves while also protecting their attacker from injury. Aikido is performed by blending with the motion of the attacker and redirecting the force of the attack rather than opposing it head-on. This requires very little physical strength, as the aikidōka (aikido practitioner) “leads” the attacker’s momentumusing entering and turning movements. The techniques are completed with various throws or joint locks.